I hardly get any nail art kits in my small town. But today when I had gone to a fancy store I was surprised to see nail art beads!! I immediately bought it and tried a simple design and thought of sharing it for benefit of the beginners like me. Step 1: Apply the base color and let it dry. 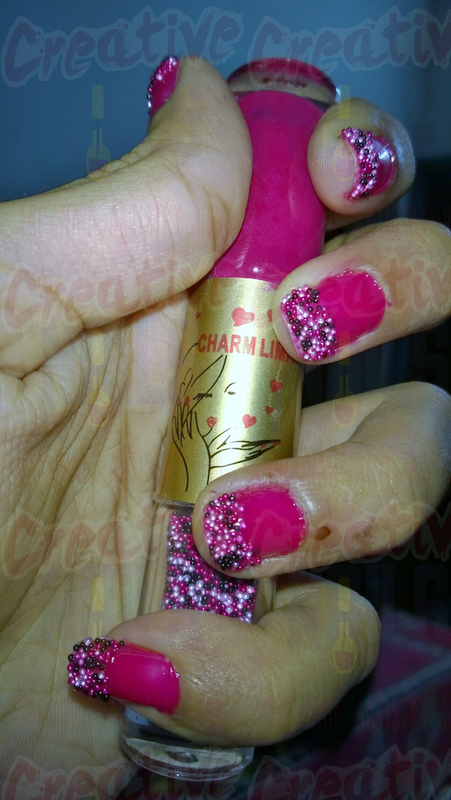 Step 2: Apply the second and third coat only at the top of your nail and before its dry, pour the beads on you nail. Beads will stick on the wet area. Step 3: Gently press those beads so that they will be distributed evenly on the surface of the nail as well as to stop them from easily falling away. Note: Before pouring beads, place a paper below your hand so that excess beads can be collected and re-used.. !! ← Fish on Nails Nail Art!